Despite my love of chocolate, cakes, biscuits, puddings and most things sweet, I do not, as it may seem, indulge all day long or even every day. Most of the time, I try to eat healthily. One of our regular breakfast ingredients is kefir, which CT has been making for many years now. We drink it as it is, use it in smoothies, on muesli and add it to porridge. I woke up one Sunday morning thinking, why don’t I try making pancakes out of it – not a revolutionary idea I’m sure, but I’d not thought of it before. 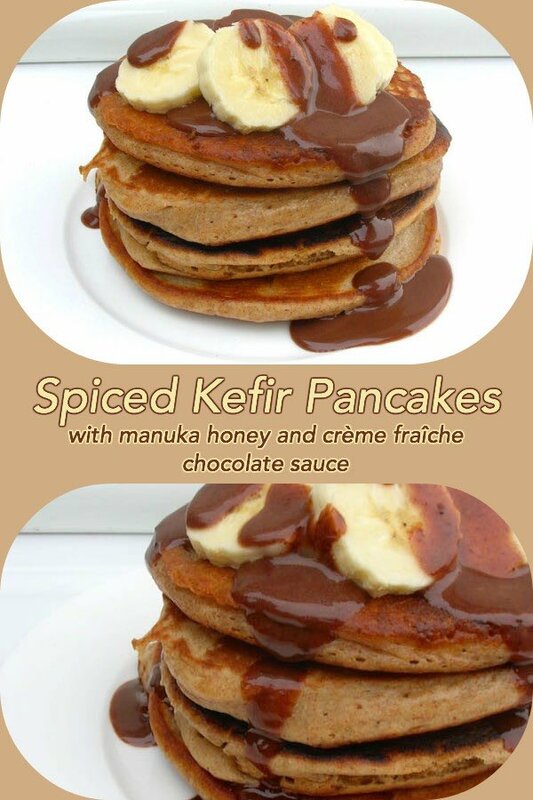 Spiced kefir pancakes with manuka honey and crème fraîche chocolate sauce it was then. For those not yet in the know, kefir is a fermented milk beverage, similar to yogurt but easier to make and with its own distinctive taste. The culture comes in the form of strange cauliflower like pieces and it grows. It comes from the Caucasus region and is highly regarded as a probiotic. These spiced kefir pancakes are a healthy take on our much loved drop scones or American style pancakes, rather than traditional English flat pancakes. They contain no sugar of any kind and the chocolate sauce is sweetened with Manuka honey, although there is a little refined sugar in the dark chocolate. Manuka honey is famed for it’s therapeutic properties and maca powder is a Peruvian super food. I used a mix of wholemeal spelt and buckwheat for easier digestion. I don’t know if I was on a microbiological crusade, but I used my homemade crème fraîche instead of cream in the chocolate sauce. Finally, whilst I’d normally fry my pancakes in butter, I used a little rapeseed oil instead. A healthy and delicious take on the much loved British drop scone or Scotch pancake. Beat the egg and cardamom extract into the kefir until well combined. Sieve the dry ingredients into a bowl, make a well in the centre then pour in the kefir and stir from the inside out until all is well combined. Place the crème fraîche and honey into a pan and heat to just below boiling point. Remove from the heat and add the chocolate. Leave to melt, then stir until smooth. Keep warm on a very low heat. Add a tsp of oil to a ceramic frying pan or other non-stick pan and place on a medium heat. Spoon the pancake batter into heaped rounds in the pan and cook for 2-3 minutes or until bubbles start to rise to the top. Flip the pancakes over and repeat. 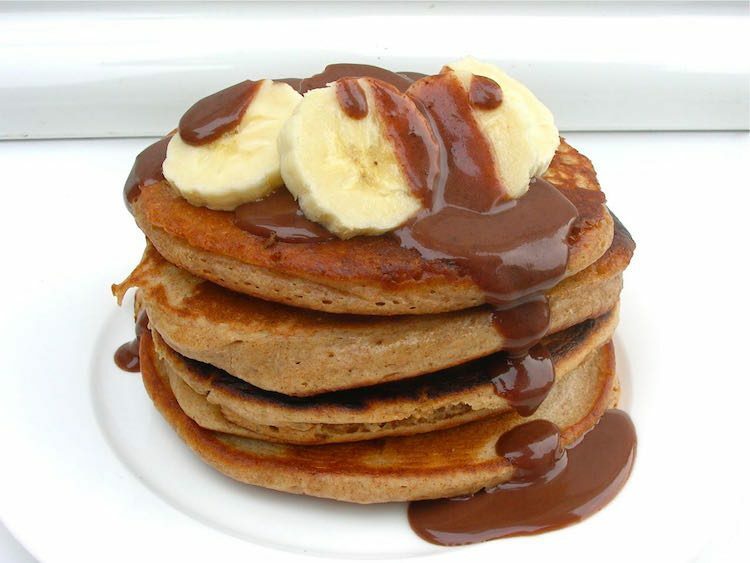 Stack 3-5 of the warm pancakes onto a plate, top with banana slices and drizzle over as much of the chocolate sauce as you like. Pancake Day is fast approaching, so these spiced kefir pancakes with manuka honey and crème fraîche chocolate sauce join many others in a pancake party for Family Foodies over at Bangers & Mash. This monthly blog event is co-hosted by Eat Your Veg. I’m also sending them off to Lucy at Supergolden Bakes for #CookBlogShare. If you make these spiced kefir pancakes, I’d love to hear about it or see a photo. For more nutritious and delicious recipes, follow me on Twitter, Facebook, Instagram or Pinterest. Spiced Kefir Pancakes. PIN IT. Wow! These look fab. I’ve not come across Kefir before – would I be right in thinking you could use it like buttermilk? Thanks. Yes you can use it like buttermilk. It has the consistency of runny yoghurt. I make kefir from time to time in my yogurt maker. It’s definitely an acquired taste but you soon get used to it. Never thought to use it in cooking though as you have done in your wonderful pancakes. I tend to put a dollop of kefir on my breakfast cereal. Kefir is one of those annoying cultures that you have to get just right Maggie. When it’s good, it’s delicious. I tried kefir last year and enjoyed it! I can imagine it would taste really good as an addition to American style pancakes. And as a varietal honey lover, I heartily approve of your manuka honey! My favorite variety is tupelo from North Florida. Honey is such a wonderful substance Katie. We have a beehive, but in three years, the bees haven’t done well enough to take any honey – so looking forward to trying some. I keep meaning to make fluffy pancakes (as opposed to crepe style) and your photos are making me even more determined! Wow, they look amazing. I like my pancakes nice and fat like that, not the thin ones you roll up. Never made or tasted Kefir, although I have heard of it, great idea. I like my pancakes both ways Janice. I grew up on the flat ones. If ever I was asked what I wanted for supper as a special treat, I always asked for pancakes and cheese sauce. I don’t make my own kefir, really need to look into it and get the grains starter, or whatever it is called. I usually buy the Polish kefir. In Russia people use kefir for making pancakes and lots of other recipes. Your recipe is pure delight. I had my first kefir in Russia when I was 15 Galina. I didn’t know what it was then, but I liked it. It wasn’t until I met CT than I had it again – haven’t looked back since. Interesting to know Russians use it for pancakes too – not that I’m in the least bit surprised. Thank you, it’s a lovely combination and works particularly well with dark chocolate. I shall head over to see your brownies soon. It’s a lot easier to keep going than yogurt Becca, so much more economical. These sound lovely, I only came across kefir recently so it’s interesting to see a recipe with it in. It’s amazing what the internet can do. No-one I knew had heard of kefir a few years ago, now quite a lot of people have come across it. 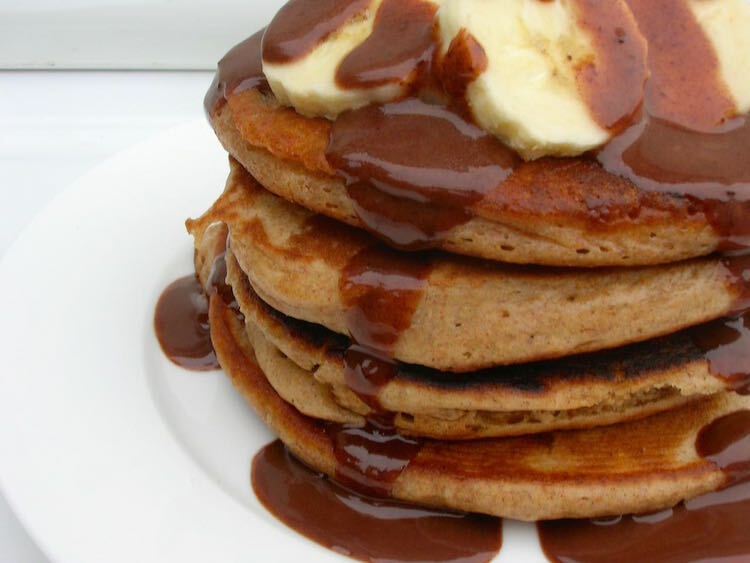 I love a good stack of pancakes and these look amazing! I love the honey and creme fraiche chocolate sauce sounds really interesting!! Might have to use it in other bakes…. Thanks Lisa. The sauce is super scrummy. Lovely idea and I’m convinced that there’s no better breakfast than pancakes – healthy or not, but healthy is certainly a bonus. They look great. You are so right Phil. Pancakes for us are a rare breakfast treat, so are enjoyed all the more. Ahhh pancakes for breakfast. Yes please. I’ve eaten kafir before but never cooked with it myself but these pancakes are stellar. Gorgeous work. Thanks Dom. Once you start making kefir, you can’t really put it on hold for very long, so we have masses of the stuff. Now discovered, I don’t think these pancakes are a one off. I like the sound of the kefir and when combined with pancakes well heck yeah. Thanks Bintu – I’m feeling like I need pancakes all over again now. Thanks GG. I leave the making of this to CT as I don’t like the look of the culture, it puts me off, but it is easy. I’ve never had kefir before but it clearly works in a pancake! 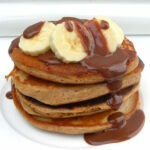 Your pancake stack looks really inviting and I love the banana, honey and chocolate – yum! You have certainly educated me on kefir, fascinating. Your pancakes are far healthier than mine, and look very appetising. I used to have Kefir many years ago. A friend told me about it. I remember I used to have to put a dried fig in the water and lemon juice (if I well remember). It was a strange thing but I remember loving the taste! It is interesting that you have added it to your pancakes, very inventive and they look really yummy! Ah, I wonder if you are talking about tibi Alida, otherwise known as water kefir. We have that too in the summer, but we’ve never tried adding a dried fig – I like that idea. The one I am talking about here is milk kefir, so it is rather like buttermilk or runny yoghurt. When you get it right, it’s delicious. Wow! These are positively virtuous and wonderfully interesting! I am very impressed that you not only make your own creme fraiche, but also your own kefir. Great recipe. Well, strictly speaking, CT makes the kefir. But neither of these things are in the least bit difficult Kate. These look absolutely wonderful – and so fantastically virtuous too. Can I have double helpings please?! I’ve been given some kefir by a work colleague, but she hasn’t given me much instruction on to keep it going, is it possible that the lovely CT could send me a link or a guide on making the most of my kefir and keep it going. It’s in the fridge at the moment and is beginning to thicken, I can see the culture at the bottom of the jar. Any advice on how to use it will be appreciated too. Hi Shaheen. CT recommends Dom’s Kefir website as the best one to use. This should give you all the info you need. We used to drink a small glass everyday for breakfast, but these days tend to have it as a larger smoothie every 2-3 days. It can be used to make cheese and in all sorts of baking. Good luck.